Sperling Prostate Center is a leader in performing high resolution magnetic resonance imaging (MRI) of the Prostate. Our goal is to provide patients and physicians with extensive and detailed information to detect prostate tumors, and once detected, to obtain the exact location, volume, stage and grade of any tumor within the prostate. Current standards for prostate cancer diagnosis, including transrectal ultrasound (TRUS) biopsy, have limitations that can result in false negatives and false positives outcomes. According to the AdMeTech Foundation, a non-profit sponsor of medical research, up to 15% of men with normal Prostate Specific Antigen (PSA) levels still have prostate cancer. Even when PSA levels are abnormal, as many as 88% of men end up not having prostate cancer yet have undergone unnecessary biopsies1. Because only about 1% of the prostate is sampled during a standard TRUS biopsy, better visualization through Prostate MRI can add an important assurance that the sample is being taken from the most suspicious areas. A Prostate MRI provides a way for the experts to obtain the best available information that can lead to better diagnosis, better patient treatment decisions and better outcomes. MRI Imaging: The Sperling Prostate Center uses next generation, advanced MRI technology along with a proprietary protocol to obtain high-resolution 3D images. The images are diagnostic-quality and highly useful to clinicians in identifying and diagnosing prostate diseases. Additionally, medical images resulting from prostate MRI can be combined with powerful post-processing computer programs to provide very detailed information about the prostate. MRI images from the Sperling Prostate Center are examined and enhanced using our customized computer technology and then configured for electronic transmission or printed for mailing. The advanced images can offer a wider variety of diagnosis and treatment options for clinicians and patients. Tumor Detection: Our protocol is designed to go well beyond just tumor detection by helping to identify the precise location and volume of suspected tumors within the prostate gland. We use multiparametric MRI for tissue segmentation and characterization along with T2-weighted (T2W), diffusion-weighted (DW) and dynamic contrast enhancement (DCE) to help delineate areas of abnormal (diseased) tissue from normal tissues and to identify suspected tumors for a targeted biopsy. Additionally, an MRI-Guided Prostate Biopsy can help determine if any cancer found is confined to the prostate, or if it has spread outside of the prostate gland. The above T2-weighted MRI images have arrows at low signal intensity areas, i.e. areas suspicious of containing prostate cancer. The representative sections show the area suspicious for cancer in the prostate gland at different planes i.e. (a) axial or front, (b) coronal or top, and (c) sagittal or side. The histopathology slice (d), with cancer outlined, closely corresponds to the MR image. The above (a) axial image shows a T2-weighted MRI image with an MRI spectroscopic grid overlaid that demonstrates voxels suspicious for cancer (asterisks) in left peripheral (outer) zone. The (b) image shows a metabolic map generated with choline+creatine/citrate ratio overlaid on the MRI image showing an area suspicious for cancer. MRI-Guided Biopsy – The Sperling Prostate Center can perform a targeted biopsy of suspected prostate tumors using our advanced MRI images of the prostate. Our Radiologists typically takes 2 or 3 biopsy samples rather than the 12-14 needles commonly used for a standard transrectal ultrasound (TRUS) biopsy (or the possible 60 needles used for some transpernieal saturation biopsies). Because our MRI-Guided Biopsy is highly targeted to the same tissue revealed by MRI imaging, patients find it generally more comfortable than traditional TRUS biopsies. Additionally, Urologists have the confidence that all tissue samples come from locations identified as having the best chance of containing cancer2. This constitutes a truly superior approach to standard systematic TRUS biopsies which are comparatively “blind” when contrasted with MRI guidance. Learn more about MRI-Guided Biopsy. MRI/TRUS Fusion Biopsy – The Sperling Prostate Center also offers an MRI/TRUS Fusion Biopsy performed in collaboration with specially trained Urologists. To perform this procedure an MRI image is fused with an transrectal ultrasound image using special fusion software. The specialized equipment, combined with the support from the Sperling Prostate Center, allows Urologists to perform a targeted biopsy by identifying precise locations within the prostate to sample. The MRI/TRUS fusion provides Urologists the most sophisticated high-resolution imagery and navigational information available. The result is a significantly enhanced prostate examination and biopsy sampling. The process provides Urologists the confidence of precise needle placement in areas identified by the Sperling Prostate Center during the MRI scan. Learn more about MRI/TRUS Fusion Biopsy. Sperling Prostate Center uses state-of-art pathology (laboratory analysis of the tissue samples from the biopsy) to grade and stage cancerous tumors, including the use of molecular markers such as PCA3 and new gene sequence tests to help better understand the aggressiveness of the tumor. The pathology findings provide the final conformation of prostate tumors and help to identify both the volume and level of risk (or aggressiveness). Today many tumors are being identified at a very early stage and at a level of risk that might not necessarily threaten a patient’s life and may qualify for a tailored treatment3. Although some prostate tumors are still very dangerous, the question arises around selecting the best treatment. What patients want is clear, reliable information that will help them and their doctors make an accurate diagnosis and if treatment is determined to be the best course of action, the choice of treatment will depend on many factors, especially the nature of the prostate disease itself. As a next step the patient’s MRI scans are combined with pathology findings to confirm the location, size and aggressiveness of any identified tumors. The end result is a detailed prostate MAP that provides the best possible tumor information along with a blueprint for treatment selection and treatment planning. The prostate MAP also identifies the precise location of sensitive structures that the physician can leave untreated if appropriate (e.g. the neurovascular bundles). The primary value of Prostate MRI Detection and Mapping is to provide valuable information in planning a patient’s prostate treatment and follow up. Our goal is to provide patients and physicians with extensive and detailed information to help determined the best course of action, including the best choice of treatment, and the best way to plan and execute that treatment. Specifically, an MRI-Guided Prostate Biopsy can be very useful in planning surgery or radiation treatment. Learn more about an MRI before Surgery or Radiation. Prostate MRI provides more clear and detailed images of the soft-tissue structures of the prostate than other imaging methods. The level of detail makes MRI an invaluable tool in early diagnosis and evaluation of tumors. Prostate MRI images can help physicians evaluate the function as well as the structure of many organs. MRI contrast material is less likely to produce an allergic reaction than the iodine based materials used for conventional x-rays and CT scanning. 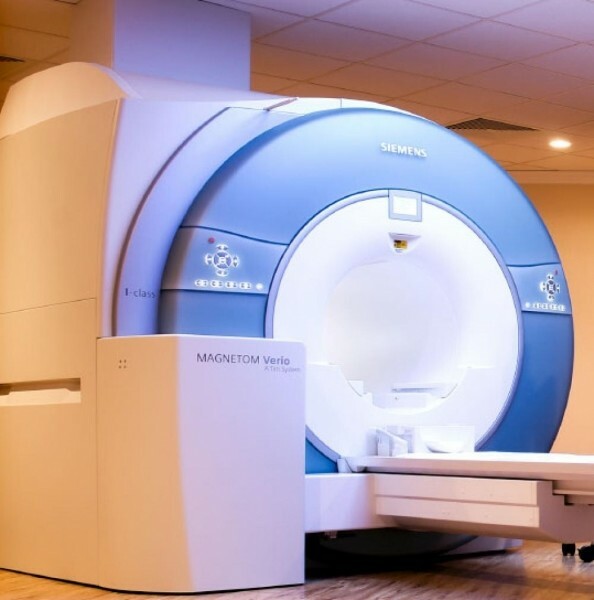 Magnetic resonance imaging (MRI) and magnetic resonance imaging-spectroscopic (MRI-S) examinations are both FDA-Cleared for use in the prostate. Patients with severe and chronic infection (prostatitis) or prostate abscess, or an enlarged prostate, called benign prostatic hyperplasia (BPH). Patients who elect to choose a comprehensive, conservative alternative to repeat biopsies when they receive the diagnosis of High Grade Prostatic Intra-Epithelial Neoplasia (HGPIN). Patients with a rising PSA level yet negative biopsy. The detailed information provided by MRI can lead the doctor to the area most suspicious for disease, thereby increasing the chance of obtaining a comprehensive biopsy (Anastasiadis 2006). Patients who have experienced a biopsy one or more times and want to improve the sensitivity of diagnosis for malignancy, if present. Patients looking to identify the precise size, location and extent of prostate tumor(s). Patients looking to help confirm the stage and grade of a tumor, if found. Patients looking to determine if a tumor is confined to the prostate, or if it has spread outside the walls of the prostate gland. A patient’s radiation treatment therapy can be planned, as it is important that the radiation be targeted to only the affected area. An MRI can provide a clear picture in helping the oncologist guide the therapy that is most appropriate for a particular patient. Patients who are considering a radical prostatectomy, including a robotic procedure. An MRI can provide a clear picture in helping the urologists to guide the surgery to be effective while reducing morbidity (meaning side effects). Patient considering an ablation, including Laser, Cryoablation or HIFU. Patients considering a focal or targeted treatment by Laser, Cryoablation or HIFU. Patients who have a local recurrence, indicated by a high PSA level, following a radical prostatectomy, radiation, Cryoablation, HIFU or Laser Ablation. MRI can evaluate the entire area for abnormal tissue. MRI exams typically take 45 minutes. A prostate MRI involves contrast, an injection that makes the images more vivid and informative. MRI exams are FDA-Cleared and covered by Medicare and private Insurance. MRI images of the soft-tissue structures of the body including the prostate and other pelvic structures are clearer and more detailed than with other imaging methods. This detail makes MRI a valuable tool in early diagnosis and evaluation of tumors. MRI spectroscopy, MRI diffusion and MRI perfusion can examine the chemical makeup and other tissue properties of the prostate which can be helpful in identifying prostate disease, including possible malignancy. IMPORTANT: The images shown are for illustrative purposes only. Do not attempt to draw conclusions or make diagnoses by comparing these images to other medical images, particularly your own. Only qualified physicians should interpret images; the radiologist is the physician expert trained in medical imaging. AdMeTech Foundation. Prostate cancer crisis: key statistics. http://www.admetech.org/PCC/index.php . (2008). Anastasiadis AG et al.. MRI-guided biopsy of the prostate increases diagnostic performance in men with elevated or increasing PSA levels after previous negative TRUS biopsies.. Eur Urol . 50. 738-48. (2005). Grossfeld G & Carroll P. Prostate cancer early detection: a clinical perspective. Epidemiologic Rev . 23. 173-180. (2001).